The United States on Friday cut funding to the UN agency that supports Palestinian refugees, saying its business model and fiscal practices were an “irredeemably flawed operation”. “The administration has carefully reviewed the issue and determined that the United States will not make additional contributions to UNRWA (United Nations Relief and Works Agency),” State Department spokeswoman Heather Nauert said in a statement. She said the agency’s “endlessly and exponentially expanding community of entitled beneficiaries is simply unsustainable and has been in crisis mode for many years”. As part of its decision, the US will also call for a sharp decrease in the number of Palestinians who are recognised as refugees, reducing the current five million figure to fewer than a tenth of that number, an official familiar with the decision told the Washington Post. “Consolidating the refugee status of Palestinians is one of the problems that perpetuate the conflict,” the official said. “By endorsing the most extreme Israeli narrative on all issues including the rights of more than 5 million Palestinian refugees, the US administration has lost its status as peacemaker and is damaging not only an already volatile situation but the prospects for future peace in the Middle East,” Zomlot said in a statement. The decision came after the US State Department announced in January it was cutting its funding for UNRWA by more than half, withholding $65m out of a previously earmarked $125m aid package. The cuts have fuelled despair and protests over recent months in Gaza, the Palestinian enclave besieged for 11 years, where 1.3 million people out of two million residents are refugees, and 80 per cent of the population is dependent on aid. In July, after 125 local UNRWA staff members lost their jobs and 800 more had their contracts downgraded in the wake of the cuts, a Palestinian aid worker attempted to set himself on fire during a demonstration. “UNRWA has thrown my family and I onto the street. The street will not be able to sustain us,” Nidal Wishah, the aid worker, wrote in a column published by MEE. For nearly 70 years, the agency offered registered Palestinian refugees in the occupied territories, Lebanon, Jordan and Syria access to education, health care and social services in addition to providing support to purchase food. US President Donald Trump has argued that the US, which has been the largest donor to the agency for decades, is paying too much without getting “appreciation or respect”. “With Palestinians no longer willing to talk peace, why should we make any of these massive future payments to them?” he tweeted in January. Many Palestinians, however, say the US is cutting the aid to pressure them into going along with the Trump administration’s so-called “deal of the century” peace plan, and to strip the majority of Palestinians of their refugee status, erasing the issue of the right of return altogether. One former US Agency for International Development official told Foreign Policy, which first reported the story earlier this week, that the US decision to cut all funds was “dangerous”. 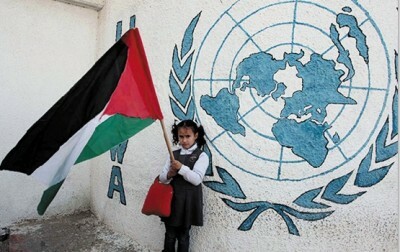 “An immediate and capricious cut off of UNRWA funding … risks collapsing the Palestinian Authority, empowering Hamas, and shifting the responsibility of health, education, and ultimately security services to the Israelis,” Dave Harden was quoted as saying. In an opinion piece for MEE on Friday, journalist Ben White wrote that the halting of aid to UNRWA is only the latest in a series of US policy moves to “defeat the Palestinian struggle”.